After stowing away in hidden compartments, Han and Luke disguise themselves as Stormtroopers while Ben goes on his own to disable the tractor beam so the ship can escape. Learning that Princess Leia is aboard the station, Luke hatches a plan to rescue her. Leaving the droids stationed near the ship, Luke and Han lead Chewbacca into the detention block, pretending he's a prisoner. 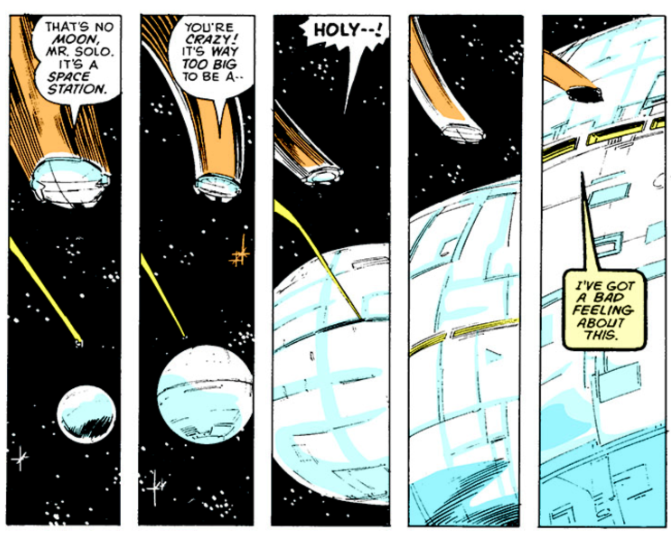 When Chewbacca suddenly "breaks free", Luke and Han are able to wipe out the troops stationed there. As Han tries to call off reinforcements, Luke frees Leia from her cell. But they're quickly met by a retreating Han and Chewbacca, and Leia realizes they have no way to get out of the detention block. 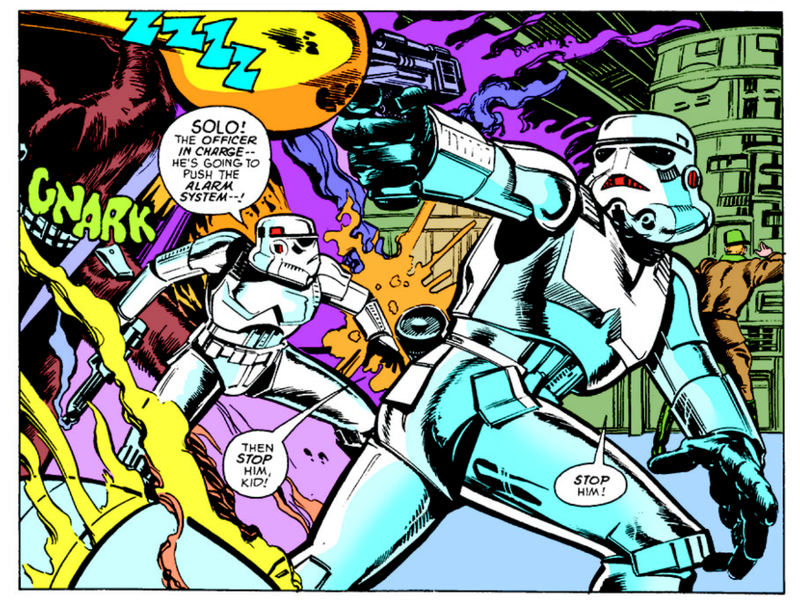 As Luke desperately calls Threepio for help, the Stormtroopers draw ever closer. 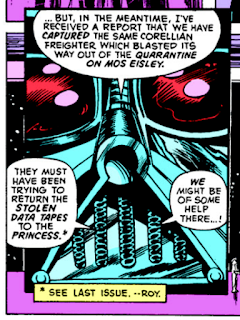 Upon approaching the Death Star, Threepio declares that he's "got a bad feeling about this", the first such utterance of that Star Wars mantra in the comic book series. We see TIE fighters, the short range fighter craft of the Empire, for the first time. Han and Luke meet Princess Leia in this issue, bringing together the Original Trilogy's trio of main characters for the first time. The Force continues to get quotes, as does the "remote" Luke uses when training aboard the Falcon. 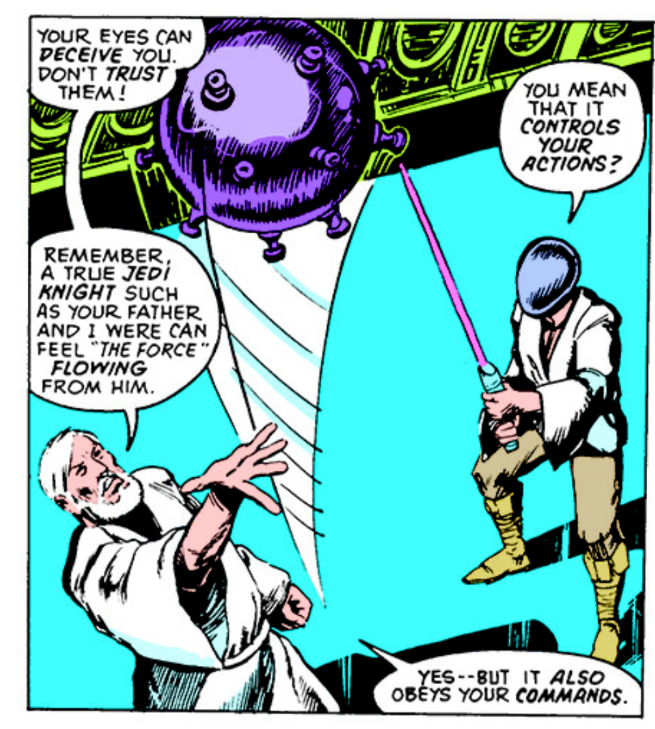 Obi-Wan is always referred to as Ben Kenobi throughout the issue. 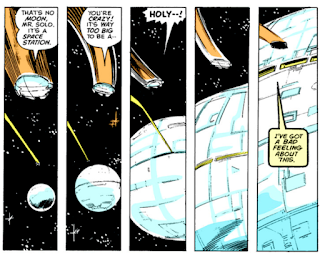 Similarly, Han is routinely referred to as "Solo", even in dialogue. 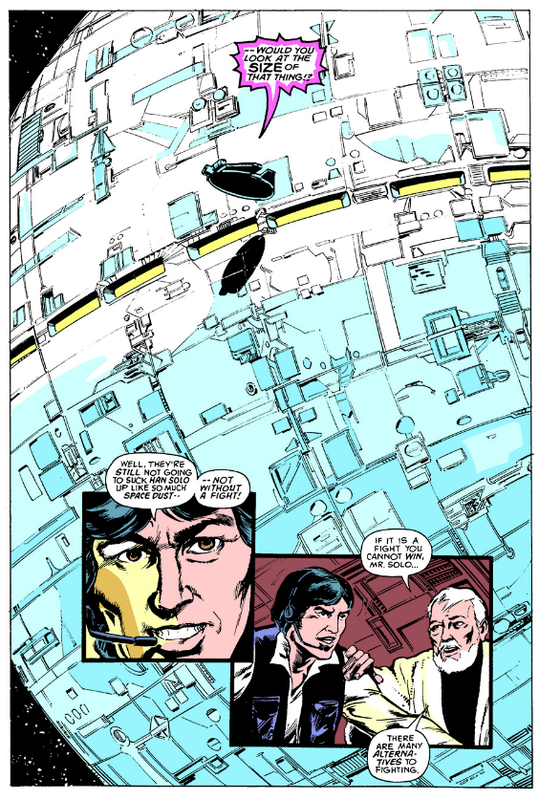 This issue hints at the Imperial plan to allow the Millenium Falcon to escape and lead the Death Star to the Rebel base, a nice bit of foreshadowing that the film doesn't do. 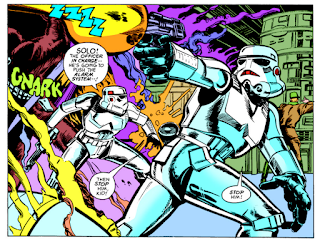 Most of the Imperial officer uniforms are colored green throughout this issue, instead of gray seen in the movie. 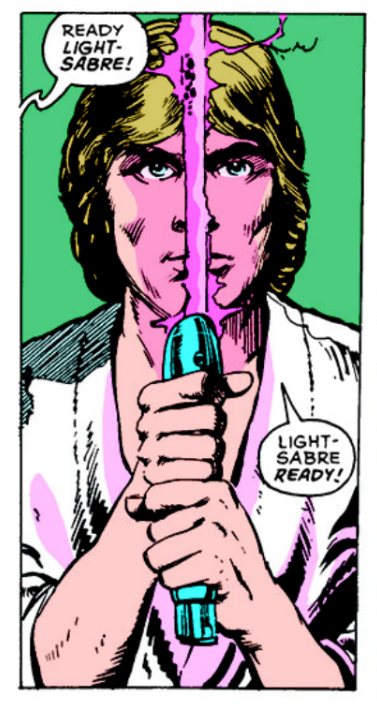 Luke's lightsaber has a purple blade, not a blue one. 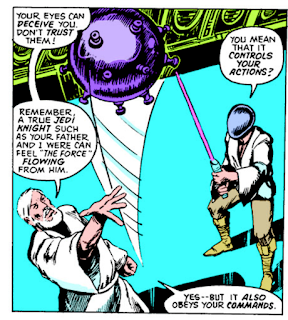 Luke's blast helmet, used in training with the remote, is just a silver blob (the remote is different too, of course). 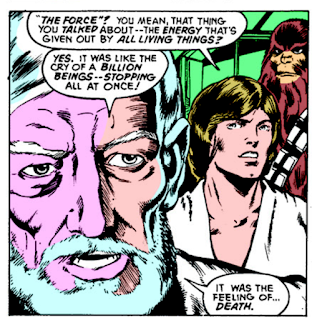 Luke drops in a bit of old school "every issue is somebody's first" exposition. When Han and Luke are in the detention block attempting to rescue Princess Leia, Luke declares that a guard is about to trigger the alarm system. How does he know that? 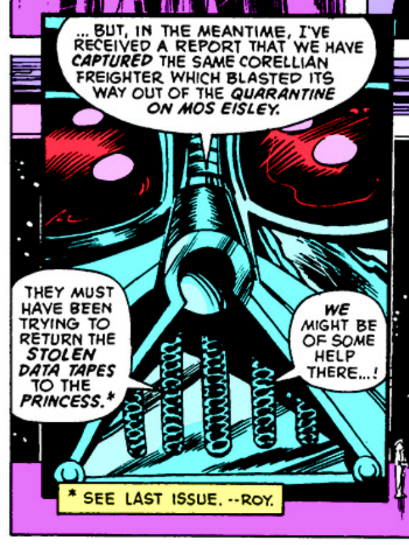 He's never been on an Imperial planet killing superweapon battle station before. I've never developed a very strong opinion when it comes to Chaykin's art; I neither love nor hate it, and nothing in these first few issues seems likely to change that. For the most, Chaykin seems to have approached this project very much like the work for hire project it was, being chiefly concerned with telling the story as efficiently as possible. And with so many characters involved on page at any given time, he doesn't have a whole lot of time or space to get terribly clever or artistic with page layouts or panel construction. 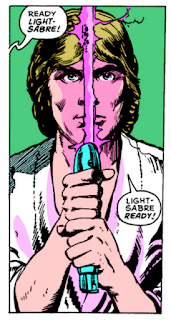 But for whatever reason, this is the first issue where the art really seemed to pop. There's a few panels, particularly a few closeup shots of characters, that are downright gorgeous, and the introduction of some more overt action elements to the story (lacking since the opening moments of the story) seems to have invigorated Chaykin. Nothing here suggests a new-found passion for the project, but perhaps getting to draw some more traditional comic book action scenes made the work feel a little less perfunctory, and that shows on the page. Obi-Wan Kenobi vs. Darth Vader! 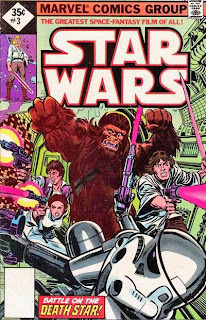 So a couple weeks ago I thought I was a week behind and read issues 2 and 3 together, ready to comment -- then realized you'd posted about the FORCE AWAKENS trailer one Saturday, so I was actually a week ahead. Now here I am, a week late to issue 3, not having read #4 yet, and therefore I've fulfilled my own prophesy and am, in fact, a week behind. So far this adaptation doesn't wow me. But then, movie adaptations never did, even as a kid. I never understood the point of reading the comic book version of a movie when I could just watch the movie. I look forward to the upcoming original material. The green Imperial uniforms, with red collars, remind of the uniforms in Marvel's G.I. JOE series a few years later. @Matt: Now here I am, a week late to issue 3, not having read #4 yet, and therefore I've fulfilled my own prophesy and am, in fact, a week behind. But then, movie adaptations never did, even as a kid. I never understood the point of reading the comic book version of a movie when I could just watch the movie. I look forward to the upcoming original material. Me too, on both counts. I will say that as a kid I always enjoyed adaptations for the stuff they included that the film didn't (like the Biggs/Anchorhead scene), which is why I think I still have an affinty for Director's Cuts of films that insert deleted scenes to this day. I just remember being endlessly fascinated by the idea of a scene existing in the story but not being in the film, having no idea then of how screenplay drafts get changed, edits made, etc. Also, once upon a time, I remember enjoying adaptations when I couldn't just watch the movie. I remember reading the comic book adaptation of Tim Burton's Batman a lot the summer it came out, cuz it wasn't like I could go see the movie every other day, while I could read the comic whenever I wanted. But once I got the home video, that desire vanished. And with the quick turnaround from theater to home distribution nowadays, it's wonder any comic book or novel adaptations are done at all. It’s weird. 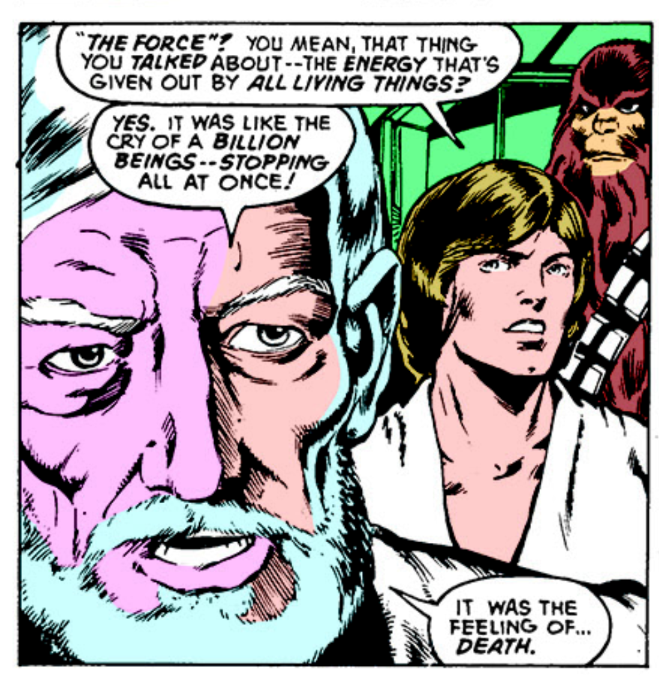 Luke uses “Ben Kenobi” as if “Ben” is an honorific, like “Ser Jorah” or “Reb Tevye” or, well, "Lord Vader". Once upon a time that was a false premise, though, as Teebore notes. 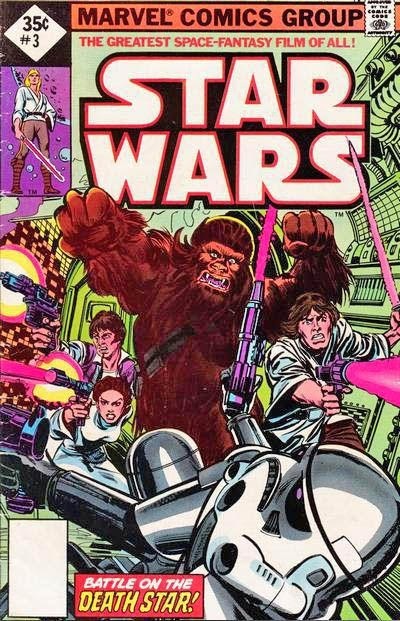 I went back to see Star Wars in the theater several times, but outside of memory we had only — in decreasing order of actual story depiction — the comics adaptation, the trading cards, and the action figures at our disposal to passively or actively replay the movie. I don’t think VCRs were even a concept to me until the '80s, although I realize they were around earlier in households more well-off and/or new-tech-inclined than ours. The first time I saw Star Wars again after its initial run was a theatrical re-release the next year. You know, I never really considered that, but you're probably right that they changed the color cuz of the problems with grays on the page.